Dimmable 18" LED SMD Ring Light with a wide dimming range from 10%-100%. 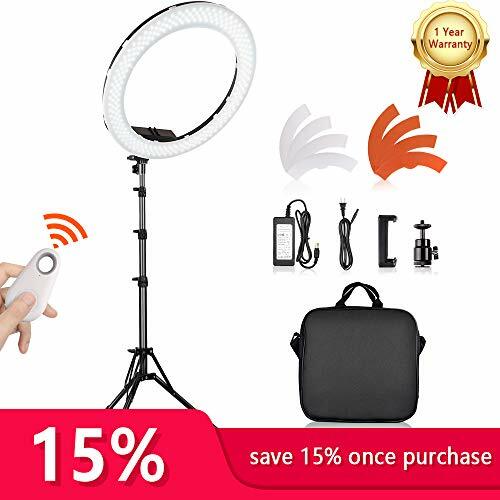 KIT INCLUDES: 1x 18'' LED Ring Light, 1x 33"-78" Light Stand, 2xDiffuser (White∨ange), 1xCradle Head (compatible with camera & phone),1x Bluetooth Self-timer for Smartphone 1x Plug, 1xPower Adapter, 1x Portable Black Bag. 2M ADJUSTABLE LIGHT STAND:Adjustable light stand can be from 33" to 78"/0.8m-2m,made by aluminum alloy with exceptional strength,highly recommanded to strech to 1.6m/66" maximum; the angle of the tripod supporting feet better >90°, meanwhile align the ring head to any one of the tripod's supporting feet. ROTATE FREELY: This kind of smartphone ring light with soft tube allows you to 180° rotate freely.The best angle of ring head inclination is less than 15°, it is perfect for YouTube video, Portraiture,Interview or ENG lighting on location or in studio. STEPLESS DIMMABLE: The dimmable studio LED ring light with a wide dimmable range from 10%-100%. This video ring light delivers continuous soft natural light with excellent color rendering (CRI>90). The adjustable ring light comes with 2 color filters (white & orange). ULTRA COMPATIBLITY: A hot shoe adapter is compatible with most DSLR cameras and a smart phone holder for most smartphones(iPhone 6 plus/6/5/5S,Samsung Galaxy S6 Edge/S6/S5,etc).Equipped with a Bluetooth self-timer, very convenient to take photos with remote control. NOTE: The camera and the smartphone in the picture are NOT included. If you have any questions about this product by Travor, contact us by completing and submitting the form below. If you are looking for a specif part number, please include it with your message.